Jul. 9, 2017 10:30 a.m.
More homes on Highway 5A, close to Princeton, are being evacuated tonight as firefighters battle a 1,500 hectare blaze near the community, while other homes along that road buttressing Princeton’s boundaries are now under evacuation alert. A release from the RDOS minutes ago indicates that 46 homes south of Summers Creek Road will be evacuated tonight, and an additional 73 homes located on the highway up to Princeton boundaries are now under alert and residents there need to be prepared to evacuate if necessary. The Spotlight will post a full list of new properties on evacuation order and alert when it is available. The map can also be found below. The fire has not changed in size or behavior, said Tracy Wynnyk, communications official for Wildfire BC. The new orders are at the command of an Incident Management Team from the ministry that arrived in Princeton today. “Nothing blew up, nothing went crazy. They are just there doing their thing and making things workable for managing the fire and the safety of the public. The evacuation of Missezula Lake homes will occur in stages overnight, at 2 a.m and 5 a.m. Many of the residents of the area have already left of their own accord, said Lyle Thomas, communications officer for the Town of Princeton. The evacuation will occur in the early hours of the morning, as that is when the fire, described by a forestry specialist as “creeping down the hill towards the road” is expected to be the least active. Thomas said EMS will be going door to door to make sure residents are escorted from the community, which has a significant make-up of seasonal homes. All evacuating residents are asked to register with the Evacuation Centre located at Riverside on Old Hedley Road. The Princeton arena, adjacent to the evacuation centre, is already set up with cots and blankets if people need a place to sleep. “If we can’t find them a motel, we will provide space over at the arena,” said Thomas. 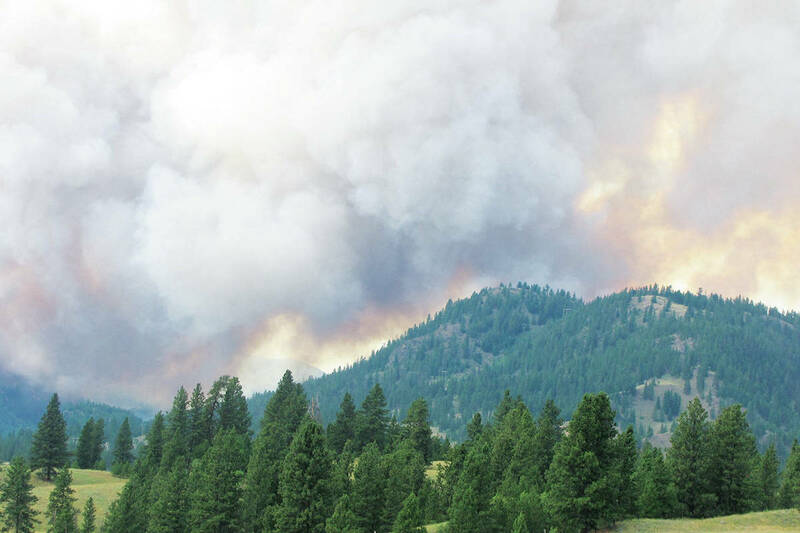 Another 195 homes near Princeton BC will be evacuated over the next 12 hours. That information was released at a meeting at the Riverside Centre minutes ago by Mitch Pence, head of the Incident Management Team brought into the area today by Wildfire BC to take control of the local suppression efforts. He said residents should be prepared to leave immediately as the evacuation orders are officially issued. He said more evacuation alerts would also be issued for houses closer to the town of Princeton. The new order will bring the number of evacuated homes to 255. As of 10:35 a.m., the fire is still at 1,500 hectares, and classified as out-of-control, she said. Previous to today, the fire suppression efforts were being coordinated from the Kamloops Fire Centre. There are 50 fighters on scene this morning supported by aircraft, heavy equipment and related personal.